Manjuyod White Sand Bar is the Maldives of Philippines. We all know that Maldives is known for its beautiful beaches, blue lagoons, extensive reefs and also being one of the most relaxing places in the world. So come to think of putting Maldives in the Philippines? Well, that simply means we don’t have to travel abroad just to see those spectacular spots in Maldives. Our very own Philippines is rich and covered with lots of beautiful tourist attractions. And you should not be shocked if there is a place located on Negros Island, the Philippines looks like Maldives. Just recently, our team Cebu Bohol Adventure visited – a place which many people considered as Maldives of the Philippines. Basically, Manjuyod White Sand Bar is pristine of 7 kilometer stretch of premium white sand. It is an island towards the North Bais Bay in the Tañon Strait that emerges only during low tides. If you do not have any idea about the place, just look at this video and imagine the beauty of it. With no sleep from work, I never thought that trip would give us perfect day adventure. And we traveled 58 km. north way to our next trip adventure. We arrived at the Manjuyod town by exactly 8 am because we had a private car and it’ll take 2-3 hours to get there if you’ll take a bus. On your way to Manjuyod town, historical buildings preserved from the Spanish era displayed along the road. The scent of the sea from Manjuyod White Sand Bar, ould almost be smell when we arrived at Manjuyod town. 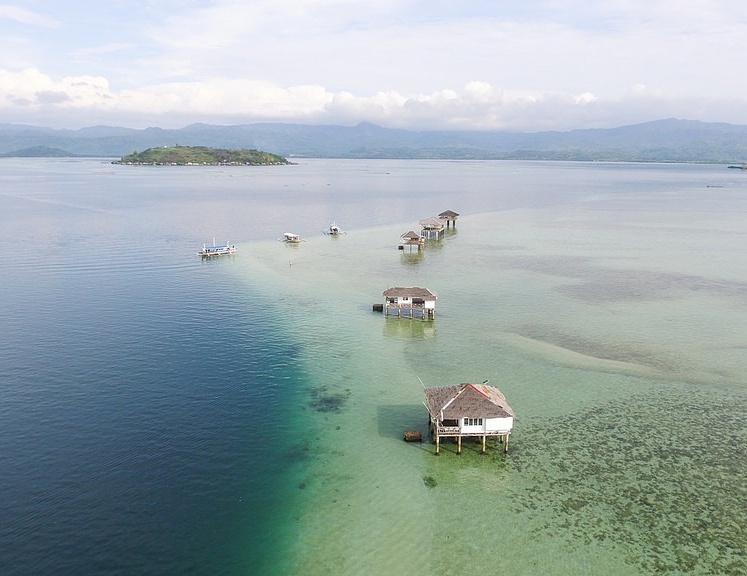 Since we’re all new to the place and we do not want to get lost, the CBA manager contacted someone to lead our way to the pier where we will be riding on the motorboat (Bangka) to reach the white sandbar. On our way to the pier, cows and goats blocked us and seemed like they don’t want us to pass the way. So cute but we arrived at the pier safely. From the pier, we need to travel 30 minutes to cross the ocean using the Pinoy boat called “bangka”. I could feel the excitement we had while we were our the way towards the sandbar. Far from the place, I cannot exactly see what they were doing but it seemed like there were people walking on the water. But as we’re getting closer and closer, I find myself funny finding out that they were not actually walking on the water but on the sand. And that’s the island already. I thought the place was just a typical island cover with beaches and it’s white sand but I was totally wrong. The island was like the appearing sand in the middle of the sea. I was in awe of the place that I was really standing on the small portion of appearing island in the middle of the sea. During the night the island will not be visible and the cottages were like floating houses in the middle of the ocean. You know what I mean? Sure thing it’s fun. It is really fun. But I am just thinking of your own safety.But For those who love adventures, I think you should try it and you will be enjoying. The water was so clear with a shade of very light blue. By that, you can clearly see some aquatic animals living in the area clustering below the water. The sand was so soft and the wind blew so nicely like caressing your skin. And you can definitely smell the scent of the ocean and can taste the saltiness of the air. I enjoyed the place. I can’t help myself but smile. Different people, different races, and nationalities gathered in the area as well. Although some of them were not understandable (I am referring to the language) but you can see the fun and enjoyment on their faces. They were in their own style how to capture a good picture. Some were in their best swimsuit attires and some were on their own craziness. I loved seeing them having fun. If you love food trip, their vendors selling tropical foods in the area too. Well, that’s it then. My colleagues and I had so much fun. It so sad that it’s ending but I am happy with what it was (credits to Taylor Swift). The beauty of that natural scenery was witnessed by everyone on that moment, in that place, and would be another story to be told. When you are there, it’s like you are certifying the presence of the island to give happiness and those who are lost and to those who wander. But only brave ones are capable of seeing the dawn of the island. Also, read Sumilon Island- a Sanctuary Paradise.